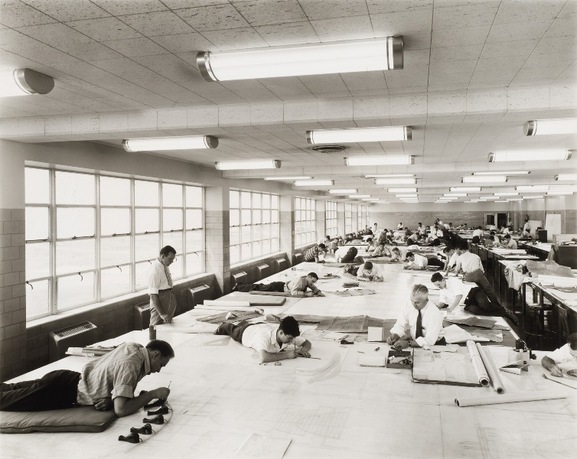 Hedrich-Blessing Photographic Studio, view of the drafting room, 1942, Albert Kahn Associates, Ford Motor Bomber Factory, Willow Run, Michigan, Gift of Federico Bucci © Chicago History Museum. The Second World War has been, in contrast to what most histories suggest, a fundamental moment in the modernization of architectural practice. The publication Architecture in Uniform, a complement to the exhibition curated by Jean-Louis Cohen (CCA: April−September 2011), offers a new perspective on the architectural history of the War, documenting a series of episodes that took place between the bombings of Guernica in 1937 and Hiroshima in 1945, which led to the definitive supremacy of modernism in architecture. Themes such as the role of cities in air war, the new buildings for industrial production, architecture's participation in actual warfare, wartime megaprojects, and postwar developments all reveal the extent of the architects' contribution in the war years, as well as the trajectories of individual architects in the war theatres, including the United States, Japan, Great Britain, France, Italy, the Netherlands, Germany, Poland, and the USSR. Jean-Louis Cohen is the Sheldon H. Solow Chair for the History of Architecture at the Institute of Fine Arts, New York University. He studied German and Soviet architectural cultures, and colonial planning in North Africa, as well as extensively interpreted Le Corbusier's work and Paris planning history. Cohen's prolific research and publication activity has focused on twentieth-century architecture and urban design. He has curated numerous exhibitions, including, most recently, Alger, paysage urbain et architecture, at the Institut français d'architecture (2003) and The Lost Vanguard, at the Museum of Modern Art, New York (2007). In 1997, Cohen was appointed by the French Minister of Culture to create the Cité de l'architecture, a museum, research, and exhibition centre opened in 2007 in the Paris Palais de Chaillot. During this period, he directed the Institut français d'architecture and the Musée des Monuments Français, the two main components of the Cité. The Canadian Centre for Architecture is an international research centre and museum founded on the conviction that architecture is a public concern. Based on its extensive collections, the CCA is a leading voice in advancing knowledge; promoting public understanding; and widening thought and debate on architecture, its history, theory, practice, and role in society today.